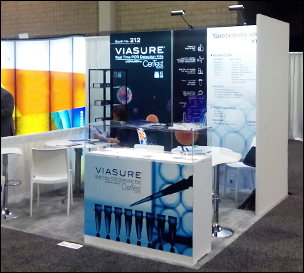 From November 10th to 12th, CerTest was present in the next Association for Molecular Pathology (AMP) 2016 Annual Meeting in Charlotte, North Carolina. More than 2,000 molecular diagnostics professionals and 233 companies attended this meeting. For the first time in this meeting, the company showed the latest products and developments for the diagnosis of infectious diseases, especially through its VIASURE product range. VIASURE is the CerTest brand created with the purpose to provide Molecular Diagnostic users a wide range of Real Time PCR kits for the detection of pathogens of interest, providing maximum flexibility and compability with leading open system thermal cyclers and the latest technology for the stabilization of products. · Ready-to-use kits. All the necessary components for the testing are included. · Transport and storage at room temperature. · Shelf-life: 24 months – for all our qPCR products-. · Easy-to-use. It minimizes the number of manipulations reducing time and possible errors. · High sensibility, specificity and reproducibility. · Possibility to analyze from 1 to 96 samples per assay. · Adaptable to a high number of commercial thermal cyclers. · Evaluated and validated according to ISO 13485 and CE marked. VIASURE includes more than 45 references for the diagnostic of viruses, bacteria, parasites and fungi. Download the available products from here. Besides, CerTest participated in the scientific program releasing the poster “Comparison of different molecular methods for the detection of non-influenza respiratory virus”.